I’ve had more discussions with students in the last few weeks about behavior and ethical dilemmas than I’ve had in the last two years put together. Working with 20 Grade 3 to 5 students has brought up many interesting situations of communal living and societal issues and I’ve had more opportunities to create a democratic environment with Minecraft than any other school activity. It has also opened up discussions with students who may not have opened up to each other and their teachers before. I have two boys in grade 4 creating a birthday cake in Minecraft for their teacher! The students who are not in the Minecraft class regularly come up to me and chat about the game and along with being a joy to talk about gaming with students it is an opportunity for teachers to relate and to find some common ground with a wide array of their students that may not have arisen without Minecraft. It’s these aspects of Minecraft that endure it to teachers all around the world right now. It has its fingers in a lot of different learning pies(!) Group work, collaborative projects, art, design, architecture, history, and geography to name but a few. Along with these learning opportunities students may experience for the first time “living” with others, a sense of independence and responsibilities that they may not have faced in the real world yet. This trialing of Minecraft in my school has been a great success so far and it paves the way for my plans to include it into one of our Units Of Inquiry and get really get it embedded into our curriculum. I’m very happy to see the progress of our group of grade 3 to 5 students in our Minecraft class. Here’s how it broke down. The first class was spent mostly on discussing our expectations and what we would like to have made by the end of the school year. Our server (which was provided free by redstonehost.com), we figured, did not like multiple logons so from this week on we staggered the logins in twos and threes and that works just fine. We had major issues with TnT and lava. One students was warned and blocked from the server until the next class. we had discussions about space and appropriate ways of constructing things. A number of students had started some big projects like an airport and made a call for collaborators. We also conducted our first videos and guided tours. Minecraft ECA Lesson: Week 2 from Colin Gallagher on Vimeo. Anton’s (G5) Guided Tour: Week 2 from Colin Gallagher on Vimeo. Our first vote on whether TnT and lava should be banned. An overwhelming vote for the “frowning upon” of using lava. I stated that lava and TnT would not be removed but every student knows the consequences of using it. More guided tours. More discussions about the world and how it’s progressing. I noticed, with cautious optimism, that issues were small and problems were being solved quicker. Where we on our way to building a utopian society!? A model of our school popped up, the brainchild of one student, Anton, who wanted to use it somehow for his PYP exhibition. A number of students helped him. Minecraft Walkabout 2: Week 4 from Colin Gallagher on Vimeo. Week 5 coincided with the update from Minecraft 1.1 to 1.2 so during the week a number of students could not get on as they updated immediately and Minecraft server was one or two days behind. It was a good learning experience for us all! Considerably less time spent discussing at the start of class. We had another guided tour by Kai. Kai had created one of the first megastructures in our world in the first week; the “stairway to heaven”. I loved the fact that he had created the little things like a 7-11 and a cloak room! Minecraft Week 5 Flyabout: 2 from Colin Gallagher on Vimeo. Kai’s Guided Tour: Week 5 from Colin Gallagher on Vimeo. Our class is running very smoothly. I’m running a little on the seat of my pants as since the Minecraft update my plugin to keep track of griefing has not worked! A motion was put forward that mobs should be removed but the class voted against it. The mob issue is a result of another plugin that has stopped working as it used to keep it as daytime all the time. Our server was a little difficult this week but students have learned to wait and login only with our permission. Until we do give them the nod to login they happily experiment in single player until its their time. Two guided tours! Minecraft Week 6: Gabriel’s Guided Tour from Colin Gallagher on Vimeo. Minecraft Week 6: Mason’s Guided Tour from Colin Gallagher on Vimeo. I will have a small follow-up post on the student who used Minecraft in their Grade 5 PYP exhibition. 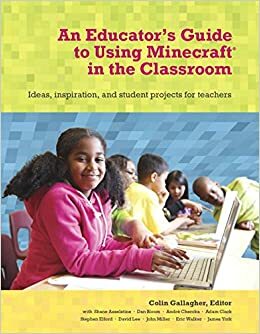 Thanks for this amazing post full of insight for a beginner minecraft teacher. After 1 month of sorting out logistics, getting my administration on board, and convincing parents, we are having our very first Grade 5 minecraft club meeting today after school. I have 17 keen students and one fellow teacher who will help me out. We have our own school-hosted server and should be totally up and running by next Friday! I’m very excited about this journey and so appreciative to have resources like you and the information and reflections that you share. Good luck Aloni, you and your students will have so much fun! Great stuff! Had a lot of the same issues (TNT, fire, griefing, etc.) when we brought up our local multiplayer server. Using the MinecraftEdu mod though has helped make the control so much easier. On a side note, I used our paid Vimeo account for our videos as well, but Vimeo recently took them off because they stated that they do not allow “game playthrough” videos. I had to move mine to TeacherTube. I would like to know if you end up receiving the same message. It took about two weeks for them to remove them. Wow, didn’t know that about Vimeo and game playthrough vids, I have not heard anything….that’s not very nice of them! No, especially since we paid for our service. I wish there was some way to have them make an exception for education-based videos. They simply deleted the videos off our account and sent us the message.